Since 2015, our four boys currently play club soccer with the Demize Academy. My husband and I decided to do everything possible to keep our children in a social, athletic environment due to homeschooling. Our family was introduced to club soccer by a fellow Demize coach. We saw the benefits of the academy program and they chose to dedicate themselves to one sport, soccer. We enrolled our first son in the YMCA program (first year of soccer) when he was 6 years old. After the season was over, we made a decision, at that time, to coach our children. We noticed a need for coaches that had patience and knowledge of the sport. Coaching came natural to both of us. We quickly began to educate ourselves with the sport through others who had played, reading manuals, viewing teaching videos and USSF coaching courses. As coaches, we were always looking for new ways to more effectively teach all aspects of the game. Over the last 9 years of coaching soccer, we found the following to be particularly valuable and effective for coaching youth players: FOCUS...on developing good footskills and fundamental technique which develop good habits; COMPOSURE...on the ball and good first touch, which takes time and patience to cultivate; PLAYER DEVELOPMENT...which is more important than winning. Attitude plays such a big role in their character as a player. These were just some of the characteristics we wanted to instill in our players, which work on and off the field. We are grateful for the opportunites and opened doors that the Demize soccer provides for youth players in Southwest Missouri. Jim grew up in Stony Brook, New York, where he began playing soccer at age six. After several years of playing in the Three Village Soccer League, Jim was recruited to play for the Stony Brook Express Select Team. While with the Express, Jim travelled with the team to play against opponents across Long Island, and participated in many tournaments throughout the Northeast and in Canada. Jim also played for both Murphy Junior High School and Ward Melville High School, enjoying an undefeated season in his freshman year. Upon graduating from high school, Jim attended Tulane University in New Orleans, where in the absence of a collegiate team, he was a member of Tulane club team. After college, Jim went on to attend law school, and upon graduating, became a practicing attorney, resulting in a long absence from soccer. 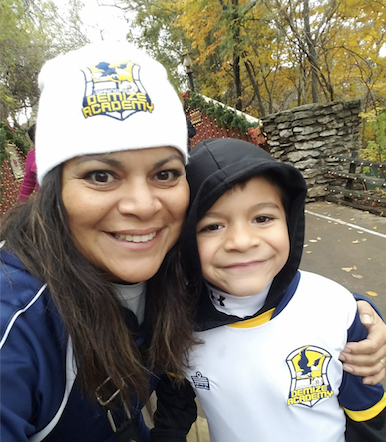 After moving to Springfield to start a family, Jim rejoined the world of soccer, coaching his two son's soccer teams. Jim's oldest son, James, began playing for Demize in 2011. When Jim's second son, Boone, moved over to Demize in 2013, Jim, after informally assisting with some coaching duties, he was added to Demize's coaching staff. Initially, Jim coached the his son's team as well as the U7 boys team and the U7 girls team. Both the U7 girls and boys won their division in Jim's second season of coaching. Jim continues as the head coach of the U10 boys team, and is an assistant coach on the U9 and U13 boys teams. He also assists in goalkeeper instruction. In his time away from the pitch, Jim is employed as an Assistant United States Attorney, specializing in the prosecution of crimes against children.